Cloud computing is the delivery of computing as a service rather than a product, whereby shared resources, software, and information are provided to computers and other devices as a utility over a network . Cloud computing provides computation, software, data access, and storage services that do not require end-user knowledge of the physical location and configuration of the system that delivers the services. Parallels to this concept can be drawn with the electricity grid, wherein end-users consume power without needing to understand the component devices or infrastructure required to provide the service. Cloud computing describes a new supplement, consumption, and delivery model for IT services based on Internet protocols, and it typically involves provisioning of dynamically scalable and often virtualized resources. It is a byproduct and consequence of the ease-of-access to remote computing sites provided by the Internet. This may take the form of web-based tools or applications that users can access and use through a web browser as if the programs were installed locally on their own computers. Cloud computing providers deliver applications via the internet, which are accessed from a web browser, while the business software and data are stored on servers at a remote location. In some cases, legacy applications (line of business applications that until now have been prevalent in thin client Windows computing) are delivered via a screen-sharing technology, while the computing resources are consolidated at a remote data center location; in other cases, entire business applications have been coded using web-based technologies such as AJAX. Most cloud computing infrastructures consist of services delivered through shared data-centers and appearing as a single point of access for consumers' computing needs. Commercial offerings may be required to meet service-level agreements (SLAs), but specific terms are less often negotiated by smaller companies. Application programming interface (API) accessibility to software that enables machines to interact with cloud software in the same way the user interface facilitates interaction between humans and computers. Cloud computing systems typically use REST-based APIs. Cost is claimed to be reduced and in a public cloud delivery model capital expenditure is converted to operational expenditure. This is purported to lower barriers to entry, as infrastructure is typically provided by a third-party and does not need to be purchased for one-time or infrequent intensive computing tasks. Pricing on a utility computing basis is fine-grained with usage-based options and fewer IT skills are required for implementation (in-house). Device and location independence enable users to access systems using a web browser regardless of their location or what device they are using (e.g., PC, mobile phone). As infrastructure is off-site (typically provided by a third-party) and accessed via the Internet, users can connect from anywhere. Utilization and efficiency improvements for systems that are often only 10–20% utilized. Reliability is improved if multiple redundant sites are used, which makes well-designed cloud computing suitable for business continuity and disaster recovery. Security could improve due to centralization of data, increased security-focused resources, etc., but concerns can persist about loss of control over certain sensitive data, and the lack of security for stored kernels. Security is often as good as or better than under traditional systems, in part because providers are able to devote resources to solving security issues that many customers cannot afford. However, the complexity of security is greatly increased when data is distributed over a wider area or greater number of devices and in multi-tenant systems that are being shared by unrelated users. In addition, user access to security audit logs may be difficult or impossible. Private cloud installations are in part motivated by users' desire to retain control over the infrastructure and avoid losing control of information security. Maintenance of cloud computing applications is easier, because they do not need to be installed on each user's computer. Cloud computing is a natural evolution of the widespread adoption of virtualization, service-oriented architecture, autonomic, and utility computing. Details are abstracted from end-users, who no longer have need for expertise in, or control over, the technology infrastructure "in the cloud" that supports them. The underlying concept of cloud computing dates back to the 1960s, when John McCarthy opined that "computation may someday be organized as a public utility." Almost all the modern-day characteristics of cloud computing (elastic provision, provided as a utility, online, illusion of infinite supply), the comparison to the electricity industry and the use of public, private, government, and community forms, were thoroughly explored in Douglas Parkhill's 1966 book, The Challenge of the Computer Utility. The actual term "cloud" borrows from telephony in that telecommunications companies, who until the 1990s offered primarily dedicated point-to-point data circuits, began offering Virtual Private Network (VPN) services with comparable quality of service but at a much lower cost. By switching traffic to balance utilization as they saw fit, they were able to utilize their overall network bandwidth more effectively. The cloud symbol was used to denote the demarcation point between that which was the responsibility of the provider and that which was the responsibility of the user. Cloud computing extends this boundary to cover servers as well as the network infrastructure. After the dot-com bubble, Amazon played a key role in the development of cloud computing by modernizing their data centers, which, like most computer networks, were using as little as 10% of their capacity at any one time, just to leave room for occasional spikes. Having found that the new cloud architecture resulted in significant internal efficiency improvements whereby small, fast-moving "two-pizza teams" could add new features faster and more easily, Amazon initiated a new product development effort to provide cloud computing to external customers, and launched Amazon Web Service (AWS) on a utility computing basis in 2006. In early 2008, Eucalyptus became the first open-source, AWS API-compatible platform for deploying private clouds. In early 2008, OpenNebula, enhanced in the RESERVOIR European Commission-funded project, became the first open-source software for deploying private and hybrid clouds, and for the federation of clouds. In the same year, efforts were focused on providing QoS guarantees (as required by real-time interactive applications) to cloud-based infrastructures, in the framework of the IRMOS European Commission-funded project, resulting to a real-time cloud environment. By mid-2008, Gartner saw an opportunity for cloud computing "to shape the relationship among consumers of IT services, those who use IT services and those who sell them" and observed that "[o]rganisations are switching from company-owned hardware and software assets to per-use service-based models" so that the "projected shift to cloud computing ... will result in dramatic growth in IT products in some areas and significant reductions in other areas." In July 2010, OpenStack was announced, attracting nearly 100 partner companies and over a thousand code contributions in its first year, making it the fastest-growing free and open source software project in history. Once an internet protocol connection is established among several computers, it is possible to share services within any one of the following layers. A cloud client consists of computer hardware and/or computer software that relies on cloud computing for application delivery and that is in essence useless without it. Examples include some computers, phones and other devices, operating systems, and browsers. Cloud application services or "Software as a Service (SaaS)" deliver software as a service over the Internet, eliminating the need to install and run the application on the customer's own computers and simplifying maintenance and support. Cloud platform services, also known as platform as a service (PaaS), deliver a computing platform and/or solution stack as a service, often consuming cloud infrastructure and sustaining cloud applications. It facilitates deployment of applications without the cost and complexity of buying and managing the underlying hardware and software layers. Cloud infrastructure services, also known as "infrastructure as a service" (IaaS), deliver computer infrastructure – typically a platform virtualization environment – as a service, along with raw (block) storage and networking. Rather than purchasing servers, software, data-center space or network equipment, clients instead buy those resources as a fully outsourced service. Suppliers typically bill such services on a utility computing basis; the amount of resources consumed (and therefore the cost) will typically reflect the level of activity. The servers layer consists of computer hardware and/or computer software products that are specifically designed for the delivery of cloud services, including multi-core processors, cloud-specific operating systems and combined offerings. 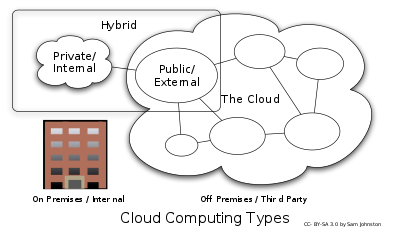 Public cloud describes cloud computing in the traditional mainstream sense, whereby resources are dynamically provisioned to the general public on a fine-grained, self-service basis over the Internet, via web applications/web services, from an off-site third-party provider who bills on a fine-grained utility computing basis. Community cloud shares infrastructure between several organizations from a specific community with common concerns (security, compliance, jurisdiction, etc. ), whether managed internally or by a third-party and hosted internally or externally. The costs are spread over fewer users than a public cloud (but more than a private cloud), so only some of the benefits of cloud computing are realised. Hybrid cloud is a composition of two or more clouds (private, community, or public) that remain unique entities but are bound together, offering the benefits of multiple deployment models. Private cloud is infrastructure operated solely for a single organization, whether managed internally or by a third-party and hosted internally or externally. They have attracted criticism because users "still have to buy, build, and manage them" and thus do not benefit from lower up-front capital costs and less hands-on management, essentially "[lacking] the economic model that makes cloud computing such an intriguing concept". 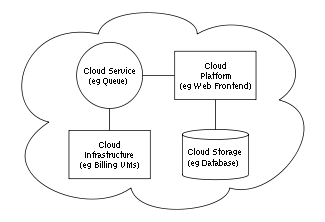 Cloud architecture, the systems architecture of the software systems involved in the delivery of cloud computing, typically involves multiple cloud components communicating with each other over a loose coupling mechanism such as a messaging queue. The Intercloud is an interconnected global "cloud of clouds" and an extension of the Internet "network of networks" on which it is based. Cloud engineering is the application of engineering disciplines to cloud computing. It brings a systematic approach to the high level concerns of commercialization, standardization, and governance in conceiving, developing, operating and maintaining cloud computing systems. It is a multidisciplinary method encompassing contributions from diverse areas such as systems, software, web, performance, information, security, platform, risk, and quality engineering. The cloud model has been criticized by privacy advocates for the greater ease in which the companies hosting the cloud services control, thus, can monitor at will, lawfully or unlawfully, the communication and data stored between the user and the host company. Instances such as the secret NSA program, working with AT&T, and Verizon, which recorded over 10 million phone calls between American citizens, causes uncertainty among privacy advocates, and the greater powers it gives to telecommunication companies to monitor user activity. While there have been efforts (such as US-EU Safe Harbor) to "harmonize" the legal environment, providers such as Amazon still cater to major markets (typically the United States and the European Union) by deploying local infrastructure and allowing customers to select "availability zones." In order to obtain compliance with regulations including FISMA, HIPAA, and SOX in the United States, the Data Protection Directive in the EU and the credit card industry's PCI DSS, users may have to adopt community or hybrid deployment modes that are typically more expensive and may offer restricted benefits. This is how Google is able to "manage and meet additional government policy requirements beyond FISMA" and Rackspace Cloud or QubeSpace are able to claim PCI compliance. Many providers also obtain SAS 70 Type II certification, but this has been criticised on the grounds that the hand-picked set of goals and standards determined by the auditor and the auditee are often not disclosed and can vary widely. Providers typically make this information available on request, under non-disclosure agreement. Customers in the EU contracting with cloud providers established outside the EU/EEA have to adhere to the EU regulations on export of personal data.